Most people usually think of a bar globe as a gift that a man would like, as opposed to a woman. But a globe bar serving trolley is a whole different story. Any woman would appreciate having a piece of home decor that is both beautiful and functional. Here are just a few reasons a globe serving cart from BarGlobeWorld.com is a great Mother’s Day gift idea. Bar trolley with 20-inch diameter 16th century world globe replica made in Italy. It’s convenient. Any mom would appreciate a functional piece of furniture where she can store bottles, glassware, stemware and accessories, then easily roll it into the room to serve guests without having to go back and forth to the kitchen or bar. A standard serving cart usually just has a few shelves on wheels, but a globe bar trolley also has a mini bar hidden inside the globe with sections for glassware, as well as a tray and shelf or shelves for extra storage. 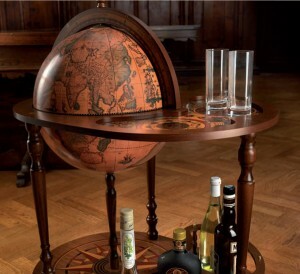 Many globe drinks cabinets have current geographical world globes and come in contemporary designer styles, but globe serving carts are usually 16th or 17th century replicas. The world globes themselves portray accurate 16th century map reproductions, and the trays and shelves are often intricately detailed. For the highest quality workmanship you should be looking at an Italian-made globe bar cart or serving trolley. But Italian or not, a vintage replica serving cart is an absolutely lovely piece of home decor that anyone would be proud to display in any room. Giving mom a replica antique globe bar cart doesn’t mean simply giving her a drinks trolley she can use around the house, it’s like giving her a piece of vintage furniture art. Many interior decorating fads come and go, but some classic vintage decor survives throughout the ages, and globe bar furniture is among them. Instead of concentrating on cutting edge interpretations, the majority of bar globe furniture manufacturers focus on producing accurate reproductions of antique pieces. Globe drinks cabinets have been around for five centuries, so it’s a pretty sure bet that a globe bar trolley won’t disappear into the “I can’t believe I owned that” category like bean bag chairs and heart-shaped waterbeds. This is a piece of antique replica furniture that can be handed down from generation to generation and from household to household. Let’s face it – it’s easier to buy a man a gift that’s something he really wants or is something fun or unique. Mom will probably smile politely as she opens her gift with a bottle of perfume or earrings, or accepts her chocolates, flowers and other standard gifts on Mother’s Day. Meanwhile on Father’s Day, dad will get to tinker with the gadget he’s been wanting or play the latest console game while mom does the dishes and secretly wishes she could play. Well mom deserves a unique gift too. Something she’d be proud to own and something she’d love to show off. A globe bar trolley can be just the thing. But if you need more ideas, buy her a gift certificate from BarGlobeWorld.com and let her choose her own!.